Zebra VC80/VC80x - Powerful vehicle folk-lift mounted mobile computer for indoors and outdoors warehouse and logistics for supply chain operations in both Windows7, Windows10 or Android 7.1.2 (Nougat) operating systems. Whether on a forklift, truck or heavy-duty crane, use the Zebra VC80x everywhere where heavy machinery users require real-time logistical information. Thanks to its highly robust construction the flexible vehicle terminal defies all weather conditions, whether in indoor halls or outdoors. Certified according to IP66 standards, the VC80x repels liquids and dust. Its strengths are particularly highlighted in outdoor storage, railway transport in airports and harbors. Even freezer environments optionally belong to its favorite operational environments, thanks to intelligent heating elements, so that the VC80x is not affected by frost and condensation. The 10.4'' resistive touch monitor ensures for a clearly arranged presentation of real-time data, and is optimally readable even in direct sunlight, thanks to a brightness of up to 1,000 Nits. As needed, six freely programmable keys expand the touch screen for even more efficient operation. Depending on the need, choose between a dual core processor with 2GB RAM, a quad core processor with 4GB RAM or a hexa core processor with 4GB RAM for scalable performance. You also have your choice between Windows and Android operating systems. With the VC80 Series, you can give operators in material handling vehicles mobile access to the desktop applications they need to complete tasks faster and more accurately. You get full Windows or Android support in a super-rugged design built for your toughest indoor and outdoor environments — from warehouses and distribution centres to airports, seaports, railway yards and more. And, you'll get the fastest wireless connections available to keep workers connected to your data and business applications. With its compact design and flexible mounting options, it’s easy to instal in forklifts, clamp trucks, yard mules, cranes and more. The VC80 Series — real desktop power for your material handling vehicles. Choose either 1,000 NITs for a bright screen that is easy to see outdoors or 400 NITs for indoor operation. The VC80x fits in virtually any warehouse or material handling vehicle and features the Android operating system. Programmable keys that simplify the most complex operations and the field replaceable touchscreen or optional keyboard which can be used even with the thickest gloves. 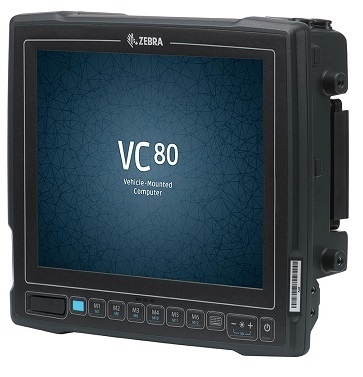 The VC80 fits in virtually any warehouse/material handling vehicle and features Windows 10 IoT Enterprise, Embedded Standard 7 or Windows 7 Professional operating system. Programmable keys that simplify the most complex operations and the field replaceable touchscreen or optional keyboard which can be used even with the thickest gloves. With the VC80x, you can easily migrate your material handling vehicles to the next generation platform for warehouse mobility. Based on Android, the VC80x delivers a well-proven mobility platform with guaranteed security support you can count on. You can migrate from Windows to Android without changing the experience you have in place today — no re-training, re-configuration, or development is required. Designed for the most extreme environments, the VC80x can go everywhere your vehicle operators need to go — inside the warehouse, out in the yard, on the loading dock and even in the freezer. And only Zebra fortifies Android with powerful Mobility DNA features to accelerate every aspect of the warehouse, from goods in to ship out. The VC80x — ultra-rugged, Android-powered for a smarter warehouse. If you are using Zebra Android handheld and wearable devices in the warehouse, workers and IT will benefit from a common operating system and solution platform. You’ll get the same user experience and management tools across different form factors throughout the warehouse and supply chain. The VC80x is ready for your toughest environments, with dust-and-water tight IP66 sealing, sealed connectors, and extreme temperature, shock and vibration testing. The VC80x is the only Android vehicle computer to offer true frost and condensation free operation with touchscreen, connectors, board and battery heaters, plus smart temperature sensors that automatically control heater and heating speed. If your workers prefer full keyboard operations, you can mount the optional rugged keyboard to the bottom of the VC80x. The keyboard’s internal heater ensures frost and condensation free operation in freezing temperatures, while drainage holes prevent heavy icing on the keyboard. Multiple mounting options, including standard RAM mounts combine with a compact size for an easy fit and easy mounting, even in the smallest vehicles. A 10-second quick release mount makes it easy to move the VC80x to another vehicle during vehicle maintenance or device repair. Every strand of your mobility platform is simpler with Zebra’s Mobility DNA. Right from the start, you have the industry’s most comprehensive suite of mobility must-haves to simplify everything from deployment to application development and add new capabilities that boost worker productivity. Since Ivanti Velocity is pre-loaded and pre-licensed, you can run your existing terminal emulation (TE) screens or HTML5 apps on the VC80x, right out of the box. Your workers get the same experience they have today — there’s no need to change your backend or re-train workers. And you can even transform your green TE screens to graphical, touch-based screens. Since the VC80x is based on Android, you’re ready for the new wave of Android-based Warehouse Management Systems (WMS). With a powerful computing platform and flexible development environment, the VC80x can grow as your applications evolve. Only from Zebra, LifeGuard™ for Android guarantees direct security updates for a total of 10 years from the release date, along with the ability to upgrade to future versions of Android1 for a superior lifecycle and return on investment. Android Certified for guaranteed security and performance Since the VC80x is an Android Certified device, you get the peace of mind that comes from knowing the device is secure and proven compatible with the growing number of Android apps built for the warehouse and enterprise.